As part of our Virtuous Circle initiative, we've partnered with Moving Targets, a Scottish-based knowledge exchange project exploring new media audiences. 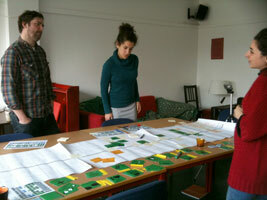 We recently tested Visual Engagement, a tool for developing innovative approaches and strategies for audience engagement. The tool has been developed by Angela Fernandez Orviz. So what's this tool good for? 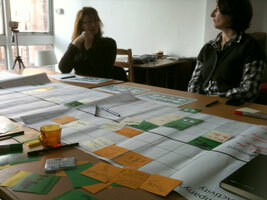 Visual Engagement is a brainstorming and planning tool to be used at the beginning of a project. Supported by the visual representation of a variety of engagement forms, it helps creators to map out their audience engagement strategy while keeping the big picture in mind and aiding formulation of an action plan. With the aid of the visual cards we brainstormed how different groups of audiences could be involved at various stages in the creative and production process. One of the first things we identified was the need for some basic market research. It is essential to make sure that those who will fall in love with the content will find out about it. That led us to reflect on who would be interested in the content. In this respect, documentaries have an advantage, compared to other media, as they usually reflect on an existing reality. Therefore, with the internet hosting millions of communities, it is easier to find and reach groups that are already discussing related topics or share a similar interest. But isn't it tricky to share content so early? fear that lack of quality in uncompleted work could drive audiences away versus the time and resources required to make it good enough to be released. However, in many situations, releasing teasers of the content may help to build an early audience which could encourage potential funders to invest in the project. Regarding the release of unfinished content, it is for the film maker to decide the right balance for the project. Will editing and publishing on-going work affect the quality of the final outcome? How will the film reach the market? How important is it for the film to build its audience in advance? But showing the process is not the only way of building an audience. We also explored the potential of generating extra-content related to the film but on a different media or platform to draw audiences from a variety of sources. What's the best time to start building an audience? 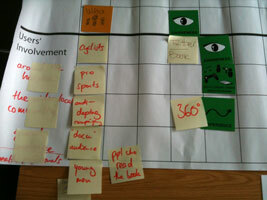 We discussed the appropriate time frameworks of both film-making and marketing. Producing a good documentary can take years of work, so the key question is: How long in advance can we start involving the audience and be able to retain their interest until the film is launched? 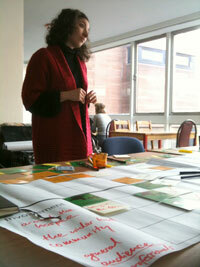 We started thinking of sustainability in terms of marketing and audience involvement. In the end we were able to find parallel content – and by parallel I mean that it does not interfere with the film-making – that could be sustainably generated by the most active audience members and retain the interest of less active audience members – a hands-off solution that would still bring awareness to the film. How useful will this be to filmmakers? The path you take to build your audience will depend pretty much on the content, topic, and resources available to you. But pausing to take a look at the big picture gave us great insight into the challenges our filmmakers would need to face in terms of building and sustaining their audience. I would like to think that these brainstorming sessions were as useful for the film makers as they were for me. Working with documentary film makers made me realise that many of the tools I use as a service designer can be very helpful in this industry. I encourage others to follow, step back for a moment, forget about the practicalities of the making, and focus on their potential audiences for a couple of hours.